and the Human Being was not born and bred for Shabbat. The Hellene takes readers back to Hesiod’s Theo-Gony, to the LXX’s Genesis, to Aristotle’s Generation of Animals. The gods are making the heavens and the earth and the sea. God is making Human Beings in His Likeness. This is the Nature of Procreation, with animal species like but certainly lower than the Human species. 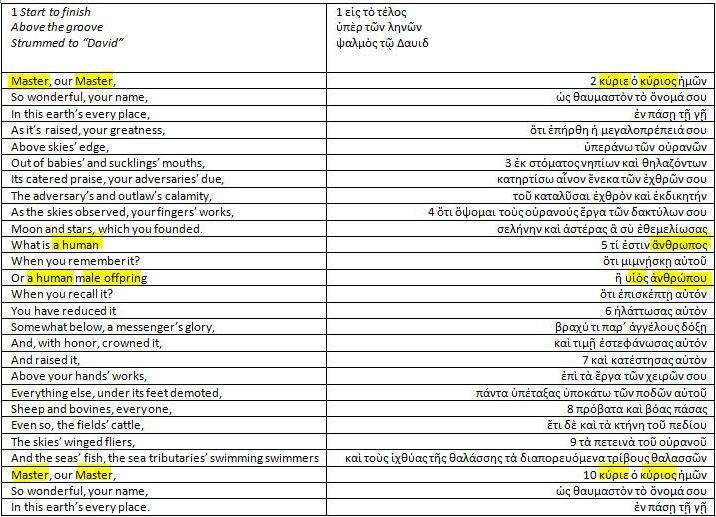 The frozen phrase υἱὸς τοῦ ἀνθρώπου takes readers back to the wordplay of the “Psalmoi” in Greek and then the rest of the Scriptures for Greek reading. We speculate, with a certain plausibility, that the Alexandrian Jews knew their Greek. They seemed to enjoy wordplay in Hellene. Those translating the Psalms seem to have engaged in literary sparks as notes Albert Pietersma reading the Greek for the NETS Septuagint. In one Psalm, what we refer to as Psalm 8, there’s the hierarchy of Master over all creation. It’s middle lines bring forth an anthropos (ἄνθρωπος) under heaven, out of earth, lower than an angel, above the animals of every species in every place. 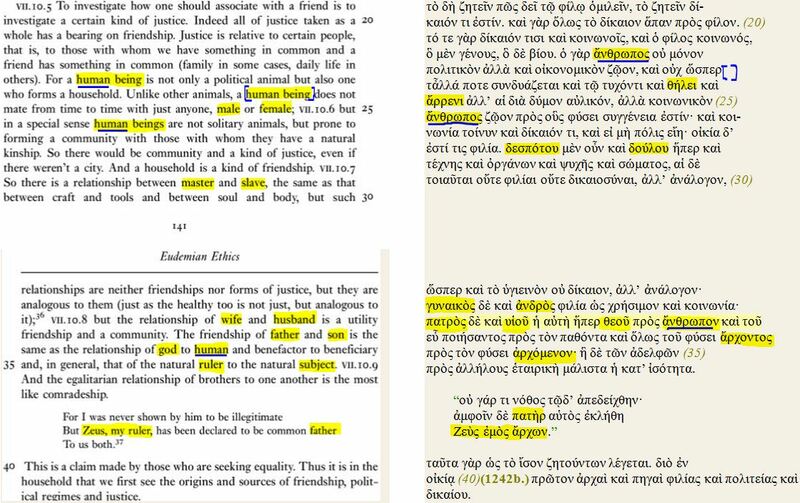 The LXX translator has Greek readers hearken back to the Hellene Genesis creation story again. The hierarchy constructed, and then deconstructed, by the movement of the Greek Psalm here is important. The classes of things in Nature, constructed and deconstructed, is important. This sort of wordplay, the literary sparks and interpretive spins here, play against the tight classes of Aristotle. Aristotle keeps the various natural categories pure, separate, stratified. I’m really intrigued by the generative angle you reveal in the Greek verb. I have never, ever heard this brought out; I’ve always interpreted “humans were made for the Sabbath” in a very craftwork/artisan metaphor space; or perhaps in the key of telos — goal, purpose. The notion of birthing/breeding deepens what’s being said here. Humans were born for this! I realize I inverted what the passage actually says, but it feels to me like a faithful translation of the sense. The contemporary idiom is featured in, say, radio ads intended to depict a way of life that is so perfectly well suited to a person that we might say it was tailor-made for them. (See, that tailor is wielding the needle in the back of my mind when I think about this passage.) But because it not only suits them, but allows them to blossom and excel, the ad turns it around: You were born for this. And on a separate thought — the breeding angle, when combined with the corporate personality symbolism sometimes attributed to Son of Man, also helps explain the next bit. Suppose we think of the Son of Man as the ultimate product of humanity, like the perfect specimen that is the result of a long line of breeding, the Quintessential Human. If the sabbath was birthed/bred for human beings, that suggests (ever so slightly) that the sabbath and humans have some kinship to each other. Then it would make sense that the Quintessential Human would have the perfect/perfected/completed/mastered relationship with the sabbath. Wow – I really like your various thoughts here! The inversion into our own English idiom really gets it. “were born for” And “the ultimate product of humanity… the Quintessential Human” is great insight; I tend not to be such an idealist and to find myself (for my own reasons) cringing at platonism, and yet when you put this in terms of breeding goals (“like the perfect specimen”) then I completely follow and appreciate what you’re getting at. σὺ καὶ ὁ υἱός σου καὶ ἡ θυγάτηρ σου / you and your male human offspring and your female human offspring). τῆς ἀγαθῆς, ἧς κύριος ὁ θεός σου δίδωσίν σοι. I’ve bolded a few words that Mark’s Jesus’s (Hellene) words seem to play off of. And, in general, why does Moses (and God) in their Hebrew have the Command to honor Father-and-Mother-as-birth-parents come right after the Command suggesting Humans were born for Shabbat? A question has come up on another forum I frequent. In many English translations the construction of “the Sabbath was made for man, not man for the Sabbath” in this verse is very similar to the construction in 1 Cor. 11 of “woman was made for man, not man for woman.” In the Greek, is there such a similarity? (as in vv 8-9) the mere creation event. What are the claims of the discussion? What are the purported implications of the Markan and Pauline constructions being “very similar”? Thanks for bringing to this blog that ECF question about a possible argument of men-over-women hierarchy based on a comparison of the passage in the gospel of Mark and the passage in I Corinthians. “The point of Jesus” vs. “the need for Jews to keep Sabbath restrictions”? Isn’t this an unfortunate summary reading of the text of Mark 3? First, there’s no inkling of a suggestion that Mark’s gospel is anti-Semitic the way it’s been suggested that the gospel of John might be (with its “Ἰουδαῖοι” vs. Jesus). Does Marks’ Jesus really undo any Jewish requirement to keep the Ten Commandments even this particular one? And isn’t Mark’s Jesus Jewish enough? Second, many Christians observe the Sabbath. And many Christians call the decalogue a universal not a set of commandments restricting Jewish people. Kurk, I’m a little puzzled at your interpretation of the comment, because it was made by a guy who is very respectful of the Jewish faith and traditions, and that’s not at all what he meant! He wasn’t saying Jesus meant the Sabbath should be undone. He believes Jesus lived as a Torah-observant Jew. The point is that Jesus was saying that because the Sabbath was made for people and not people for the Sabbath, people’s needs can override strict Sabbath observance. So the question is whether anyone could claim that a man’s needs could override a woman’s needs using the same reasoning? Over at ECF we decided that the context of the man & woman verse in 1 Cor 11 negated the idea that that verse could be used that way– but proof-texters are very good at ignoring context, so I was wondering if there was anything in the Greek construction of the verse itself that makes it different? Forgive me, Kristen, for misunderstanding the intentions in this statement (or question). ἀλλὰ γυνὴ διὰ τὸν ἄνδρα. τὰ δὲ πάντα ἐκ τοῦ Θεοῦ. Doesn’t it seem that Mark’s Greek has Jesus taking readers back into the Septuagint as a really Jewish reading? His counterparts (i.e., the Pharisees, the purists, the separatists) were being, interestingly, rather goyish, like Aristotle and like Alexander and maybe even like Caesar. I can’t see this as so much an overriding of as much as a playful opening up of the interpretation. It hearkens back to Genesis and to the Psalms (in holy Hebraic Hellene). I guess I’d have to look closer at the letter to the Corinthian Greek readers to see if that’s what’s going on there. I think proof-texters are going to have to go a long way to make this argument that’s imagined. Is the gospel of Mark structuring its Sabbath account here after the Korinthian letter? Or is Paul using Mark’s structure? Of are they both commonly constructing this out of Genesis LXX perhaps somehow? I’m pretty open usually, but this seems a far stretch. I appreciate your response, Kurk. I have been told that the “for” in “the woman was created for the man” is better translated “for the sake of.” That is, she isn’t for his use, but for his help– which seems to pick up the idea from Genesis. I do wonder if the words translated “for” in the two passages are the same word. Kristen, it’s not a bad idea to give the supposed “for” or “for sake of” a little attention. The little highly ambiguous Greek word that gets turned into such English is just a preposition: διὰ. This is why I asked what could be meant by διὰ τοὺς ἀγγέλους. Different translators have it variously as “because of the angels” and “because the angels are watching” and “for the sake of the Angels” and “out of respect for the angels” and “on account of the angels” and “on account of the Messengers” and “because of the messengers” and “has to do with the angels” and “for all the angels to see” and “show reverence as do] the angels [and not displease them]” and “especially when gathering in the company of heavenly messengers.” I’m not sure my sampling of the translations in English here is exhaustive of the possibilities for rendering this prepositional phrase but I do hope it shows the problems with being doctrinally dogmatic in any case. Think of the Greek preposition πρός. “And The Word was with God” is how the usual translation goes. What kind of withness is it?